A farmer convinces his son to help murder his wife when she threatens to sell the family farm to a hog butcher, get a divorce, and move to Omaha. Their act is not without consequence. Hollywood has been adapting Stephen King novels and short stories for over 40 years now. 2017 has been quite the year for King adaptations. "1922" is the fourth Stephen King adaptation of the year, the other three being "The Dark Tower," "It," and "Gerald's Game." The film is written and directed by Zak Hilditch and stars Thomas Jane, who is no stranger to King adaptations as he has starred in the 2007 film "The Mist" and 2003's "Dreamcatcher." Here, Jane plays Nebraska farmer Wilfred James, who owns his own land and enjoys the country lifestyle. He is married to a woman named Arlette, played by Molly Parker, who recently inherited 100 acres from her father. Arlette is not fond of country living and wants to sell the farm, move to Omaha and open a dress shop. With her determined to leave and Wilfred determined to stay, he decides to take matters into his own hands. He convinces their son Henry, played by Dylan Schmid, who is dating the girl next door named Shannon Cotterie, played by Kaitlyn Bernard, that his mom is trying to take him away from Shannon and ruin his life. This apparently means Henry and Wilfred should kill Arlette and send her to heaven because what else are you going to do when you have a disagreement with your spouse? We were pleasantly surprised by the aforementioned "Gerald's Game," which was the last Netflix original based on a King property. We loved that movie, so we thought we would give this one a go to see if their hot streak would continue. 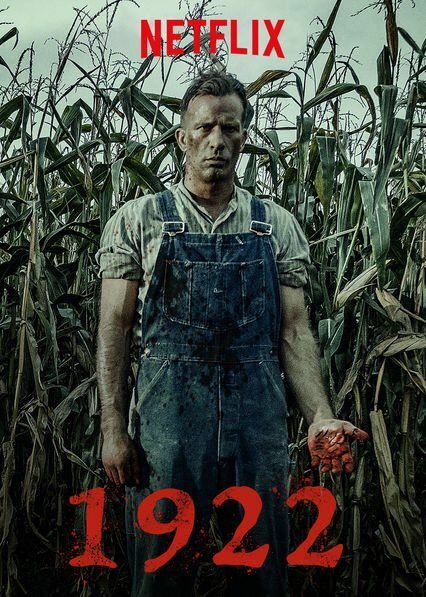 "1922" starts off promising enough. It is well shot and has good production values with a bit of an intriguing family murder scheme. The film is narrated through the confession letter of Wilfred James, so there aren't a whole heck of a lot of surprises or twists and turns. The movie is simply an exploration of how he went from being a farm-owning family man to a man plagued by guilt while writing his confession in a small city apartment. The early parts are interesting with a good amount of drama as Wilfred tries to gain the trust of his son to convince him that killing his mom is the best course of action. After the deed is done, the story becomes one of two men being haunted by the remorse they feel and the curse of bad circumstances that befall them, which they attribute to their sin. There are some interesting moments here and there, as well decent costuming, makeup work, and creepy visuals. The biggest problem with "1922" by far is its pacing. This movie is dreadfully slow. We began to lose interest in what was going on at the one hour mark, and it struggled to maintain our attention after that. In fact, we had to pause the movie real quick to tend to our dog, and we were sure it was almost over. Nope! It still had 44 minutes of runtime left and nowhere else to go. There are some things to like about "1922," we just wish it had been a little more engaging after the first hour of its runtime. At least Thomas Jane didn't drive us up the wall like he usually does.